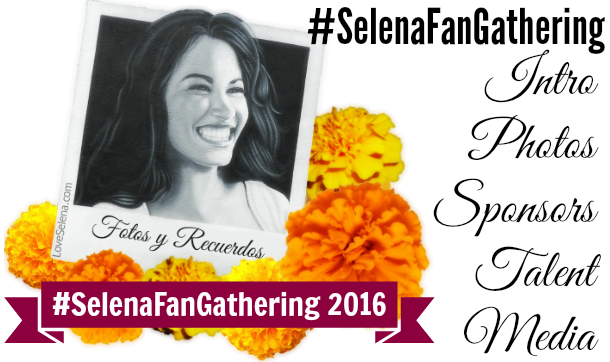 The #SelenaFanGathering is a fan tribute created by Roger Gomez in memory of Selena and to meet fellow Selena Fans. and Karol Posadas lead singer from the "Como La Flor Band". and on Display; Selena Inspired Outfit by Jessica Resendiz! 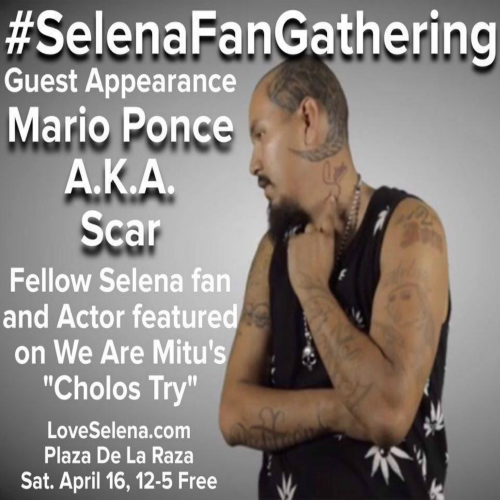 Mario "Scar" Ponce, Carlos Ayala, Omar Camacho from #CholosTry, "We Are Mitu" and "Cholos World Wide"
A glimpse as you enter Plaza De La Raza For the #SelenaFanGathering into the Art Gallery. Xochitl Palomera shows us how to do the Washing Machine with her dance class session. We brought some of the best "Washing Machine" dancers on stage and had a impromptu Washing Machine Contest. 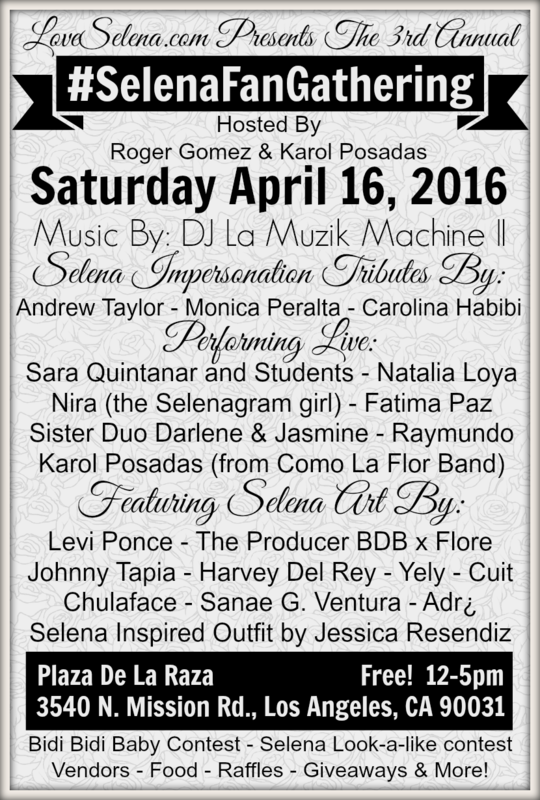 #Selena #SelenaQuintanilla #SelenaFanGathering recap Here are some of the best "washing machine" dancers we saw. We brought them on stage and had a impromptu Washing Machine Contest. Can you spot the winner? Visit LoveSelena.com for more! This fan wanted to pay homage to Selena by singing "Como La Flor"
If you know who she is please inbox us so we can put her name here. Nira (The Selenagram girl) performed Tu Solo Tu, Ya Vez and Amor Prohibido. A special shout out to these ladies who have the same Birthday as Selena, April 16. Sara Quintanar and her students tugged at our hearts with "Fotos y Recuerdos" and "Si Una Vez". Sister Duo Darlene & Jasmine perform "Dreaming Of You" and "I Could Fall In Love"
By the way, they were all winners! Raymundo performs his acoustic renditions of "No Me Queda Mas" and "Que Creias". Omar Camacho, Mario Ponce and Carlos Ayala from We Are Mitu and #CholosTry were in the house. #CholosTry... Doing the "Washing Machine" with Karol Posadas. Karol Posadas, Lead singer of "Como La Flor Band" closes with "Bidi Bidi Bom Bom" and "Como La Flor"
and all my fellow Selena fans for the love and support especially for those who attended! Join the 2017 Event Page for contest, info, updates and more!